Invulnerablog » Dauntless now available! « Invulnerable RPG now available on CreateSpace and Amazon! 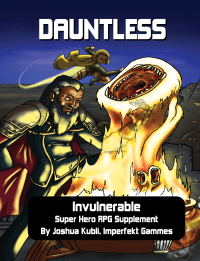 Dauntless, the first sourcebook for the Invulnerable Super Hero RPG, is now available on DriveThruRPG.Com! Click here to get it for only $2.99! You can also get it, along with the Invulnerable core rulebook, for only $5.98! What do you get? So much stuff. Over two dozen new heroes and villains as well! And you get Destroyer of Worlds, a complete adventure. Ten minutes ago, someone destroyed the world … the heroes must travel back in time, figure out who did it, and retroactively save Earth-Omega! Thursday, April 19th, 2012 at 12:07 PM.